Integrate FileMaker with Apple, Google, and Exchange Calendars. Now with Recurring Events Support, Improved Speed and Stability, Email Handler for Admin Sync Reports, and Exposed Google API key. 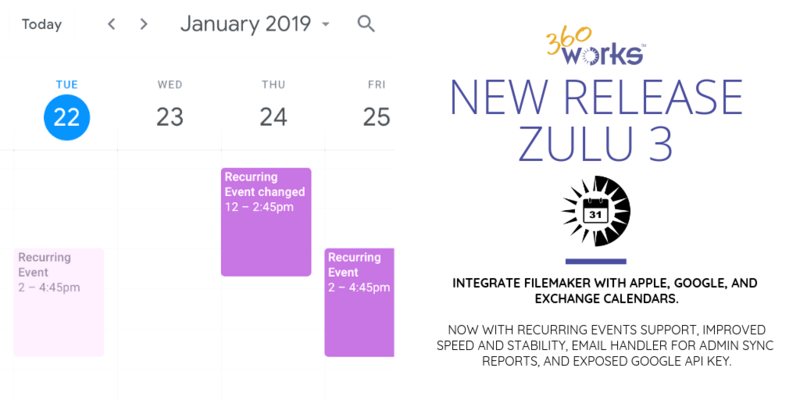 360Works is pleased to announce the release of Zulu 3. Zulu is a calendar syncing application that lets Apple Calendar, Google Calendar, or Exchange Calendar see your FileMaker table(s) as an Apple, Google, or Exchange Calendar. Syncing your FileMaker data to your device calendars makes it easier to share your calendars and keep all of your business events, appointments, and important information together! Exposing Google API key for users, so they can use their own api key and not share quota with other users. Zulu is easy to install. It is not a plug-in but rather an extension for FileMaker Server. There are no scripts to write or processes to manage. Integrating Zulu into your solution is a snap!